TEN PER CENT MORE HOLDING POWER THAN THE HIGHEST RATED EATON FULLER EQUIVALENT! This is a high performance clutch kit that is rated for 2,250 lbs.ft. of engine torque and has a 4200 pound clamp load. 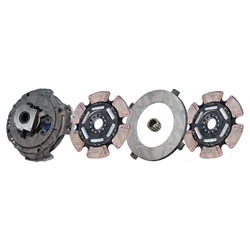 The clutch is a new Spicer Style Easy Effort 15 1/2" x 10T x 2" Pull Type Manual Adjust Clutch Set. It contains two VCT (Vibration Control Technology) clutch discs with 6 Free-Travel Coaxial springs and 6 Cerametallic Super Buttons per side. This kit uses a spline protector hub to better distribute the force of engagement over the input shaft which greatly extends the input shaft life. See also alternative clutch kits shown below. 15-1/2" x 10T x 2"
Engine Torque = 2250 lb-ft.
PB-306SS Pilot Bearing: Various Truck 2.835 in. x 1.181 in.